BAGHDAD (AP) — Iraqi novelist Alaa Mashzoub was a secular civil society activist who used his bike to get around Karbala's infamous traffic and road closures. He was also an outspoken critic of foreign interference in Iraq and political meddling by powerful Iran-backed militias. BERLIN (AP) — German authorities say they have arrested a suspected member of the Tamil Tigers alleged to have been involved in the 2005 assassination of Sri Lanka's foreign minister. The Italian Super Cup showcasing the Serie A and Italian Cup champions is normally regarded as a friendly. But there's nothing welcoming or sociable about the match on Wednesday. Because it's in Saudi Arabia. Italian politicians and human rights activists have objected to the game being played in Saudi Arabia, citing the assassination of Washington Post columnist Jamal Khashoggi at the Saudi Consulate in Istanbul. RIO DE JANEIRO (AP) — Rio de Janeiro's public security secretary says that the assassination of a city councilwoman in March was committed by militia members who saw her as a threat to their attempts to take over lands in the western part of the city. Gen. Richard Nunes made the comments about the case of Councilwoman Marielle Franco in an interview published Friday in newspaper Estadao. He did not name any suspects. Venezuela's leader repeated his frequent warning that a U.S. invasion is imminent — this time giving some details but no evidence. Nobel Prize winner Malala Yousafzai (mah-LAH'-lah YOO'-suhf-zeye) will be awarded the 2018 Gleitsman Award at a ceremony Thursday at Harvard's Kennedy School for her work promoting girls' education. The award comes with a $125,000 prize. TEHRAN, Iran (AP) — Iran's semi-official Tasnim news agency says a Sunni cleric who had worked to reconcile Sunnis and Shiites, members of the two biggest sects in Islam, was shot and killed. CAIRO (AP) — Egypt's highest appeal court has upheld death sentences against nine defendants convicted for their involvement in the 2015 assassination of the country's chief prosecutor. TULSA, Okla. (AP) — It has been 55 years since the trauma emergency room at Dallas' Parkland Memorial Hospital became the center of the known universe. "We heard people had been shot," said retired Tulsa surgeon Dr. Jerry Gustafson. "We heard the president had been shot. But it wasn't like today. It was chaotic. We didn't know. We just knew there were a lot of people coming into our emergency room." SRINAGAR, India (AP) — Assailants on Tuesday killed a prominent separatist leader in Indian-controlled Kashmir, officials and residents said, as anti-India protests and clashes followed a gunbattle that killed four rebels and an army commando in the disputed region. Rebel groups and separatist leaders called the killing of Hafizullah Mir an assassination and blamed Indian authorities, while police said it was carried out by militants. AUSTIN, Texas (AP) — Two more men have received long prison sentences for a 2015 assassination attempt on a state judge outside her home. MEMPHIS, Tenn. (AP) — A Spanish-language reporter who faces deportation after his arrest while covering an immigration protest in Tennessee said Tuesday he was unjustly detained and faces danger if sent back to El Salvador. RIYADH, Saudi Arabia (AP) — Britain's top diplomat met Monday with King Salman in Saudi Arabia, where he was expected to press the kingdom to fully cooperate with a Turkish investigation into last month's killing of Saudi writer Jamal Khashoggi at the kingdom's consulate in Istanbul. WASHINGTON (AP) — The assassination of Afghan leaders in Kandahar province won't lessen U.S. support for the war in Afghanistan or deter local security forces in the fight against the Taliban, the top U.S. military commander in the Middle East said Saturday. KABUL, Afghanistan (AP) — A high-level meeting on security plans for Afghanistan's parliamentary elections had just concluded when an elite Afghan guard turned his gun on the departing delegation Thursday, killing the powerful Kandahar police chief but missing the top U.S. commander in the country, Gen. Scott Miller. 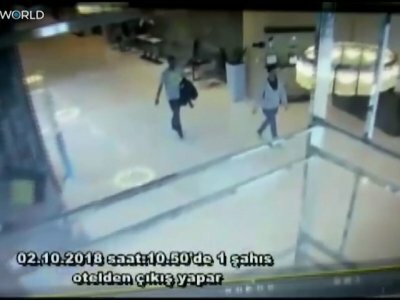 ISTANBUL (AP) — Two Gulfstream jets carrying 15 Saudis landed at Istanbul's Ataturk Airport before dawn on the day last week that journalist Jamal Khashoggi entered the Saudi Consulate and vanished. The men checked into hotels and left Turkey later that night. Although set in the aftermath of President John F. Kennedy's assassination, "November Road" avoids being another novel about that fateful day in Dallas. Instead, this superior novel from Edgar winner Lou Berney melds crime fiction with a tale about people reinventing themselves, played out during a cross-country automobile trip. NEW YORK (AP) — For crime writer and Oklahoma native Lou Berney, there's something special about the drive out West. "I love that stretch of I-40, what used to be Highway 66, from Oklahoma City to Arizona," he told The Associated Press during a recent interview. "I remember hearing about the painted desert when I was a kid, and thinking, 'Oh my god, there's a painted desert somewhere!' It was so magical. The petrified forest. It had this myth for me."